This past May, the University of Hawai‘i at Mänoa released the concept designs for the planned Daniel K. Inouye Center for Democratic Leadership. The center, to be housed on the university’s Mänoa campus, will honor a man known as a decorated World War II hero and Medal of Honor recipient, a strong political leader, a respected and loved son of Hawai‘i and, to his only child, Daniel Ken Inouye Jr., a loving father. U.S. Sen. Daniel Ken Inouye died Dec. 17, 2012, at the age of 88. At the time of his passing, he was the longest-serving member of the United States Senate and was the Senate’s pro tempore, placing him third in line to the presidency. Inouye was elected to the territorial Senate in 1958. In 1959, the year Hawai‘i achieved statehood, Inouye became Hawai‘i’s first elected member of the U.S. House of Representatives. He was elected to the U.S. Senate in 1962, where he served until his passing. In an exclusive interview with the UH-Mänoa Journalism Department’s online news magazine program, Ka Hui Ho‘olauna, Daniel Ken Inouye Jr. — known to most people as “Ken” or “Kenny” — shared many stories about his father and revealed another side of one of Hawai‘i’s most prominent leaders. The senator was often away from home on extended trips due to his Senate duties and political career. In spite of that, Ken Inouye said his father remained present in their family life. “He oftentimes would call back to the house to my mother, probably about four or five times a day, like whenever he had a break between meetings,” said Inouye, who works as a political consultant in the D.C. area. Family was an important part of the late senator’s life. The Inouye family resided in the Washington, D.C., area because of the senator’s work, but returned home to Hawai‘i as often as possible. Some of Ken’s best memories of his time with his father took place in Hawai‘i, at the movies. 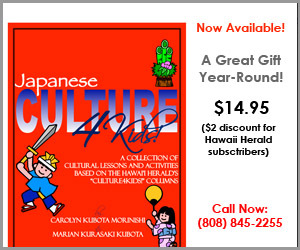 A fan of samurai films, Inouye took Ken to the movies often, making it one their favorite father-son times together. “I remember the first time I ever went to a foreign film. It was a Japanese theater and they were showing a samurai film there — ‘Lone Wolf with Cub: Baby Cart at the River Styx.’ It was the second installation in the Lone Wolf with Cub movie series,” he recalled. “Lone Wolf with Cub: Baby Cart at the River Styx” is just one of many memories Ken Inouye has of his early life with his father. But the one closest to his heart occurred Dec. 19, 1976 — he still remembers the date — in the metropolitan area of Washington, D.C. For Ken Inouye, it set the bar for his father’s love. “I’ll never forget it as long as I live,” Ken said with a smile on his face. “When you think about it, being a parent means doing things for your kids because you love them, even if they’re not something you would normally want to do. KISS was a hard rock band known for painting their faces black and white and for wearing outlandish outfits during their performances. To this day, almost four decades later, Ken Inouye holds the memory of that concert close to his heart, and it’s because of his father’s desire to not disappoint his son that Ken is determined to be a good father to his own daughter. 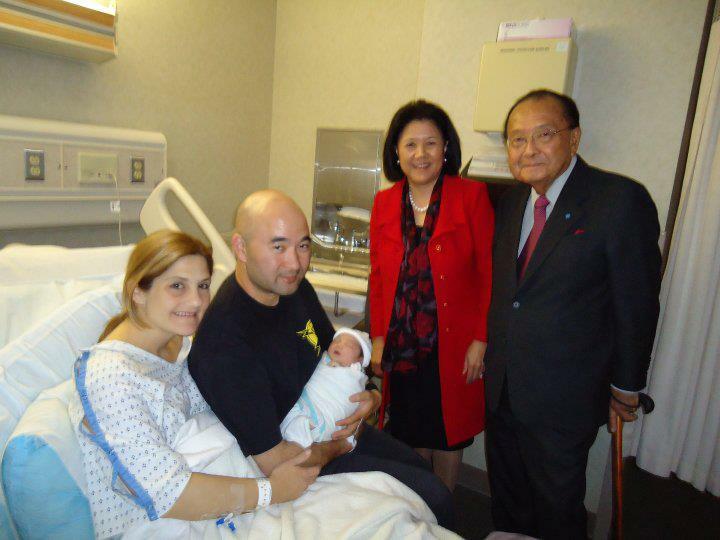 In addition to being there for his son, Sen. Inouye wanted the best for Ken. He also wanted his family to live a normal life, in spite of his demanding workload and schedule. “If there’s one thing that I did understand and always appreciated, no matter what my age was, was how hard the guy worked,” said Ken Inouye. “That alone, the workload, and the time demands of it, made it such that our family life was quite different from the family lives of other folks. “For instance, he made it a point to try to have family dinner five nights a week. If you know anything about the schedule of someone in his position, that’s pretty darn unique. It also meant that he wasn’t getting home for dinner until about 7:30 at night, typically. He’d come home with these huge bags full of stuff that he’d have to go through. He’d take everything out of the bags and stack it up on the kitchen table after we got done with dinner. 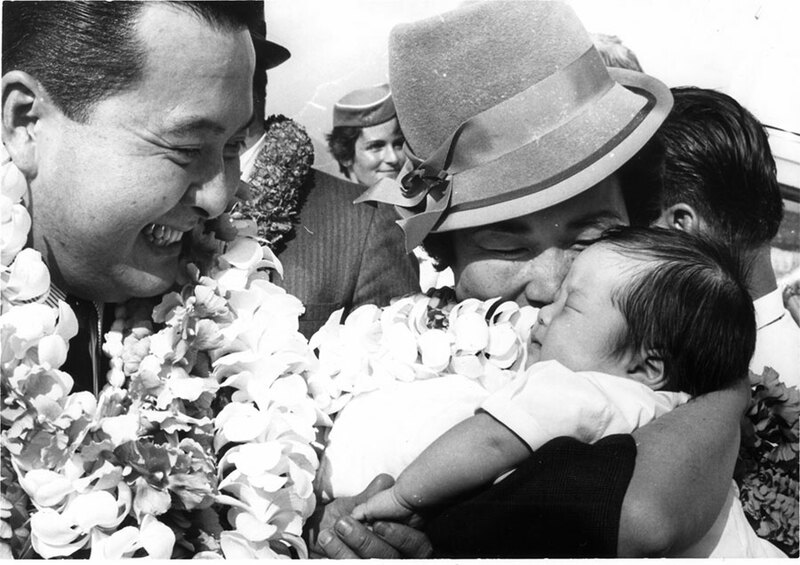 Ken Inouye’s love for his dad and appreciation for his work for the people of Hawai‘i and the nation are the inspiration behind his desire to preserve his father’s legacy. That’s why he is excited about the establishment of the Daniel K. Inouye Center for Democratic Leadership at the University of Hawai‘i, where his father earned his bachelor’s degree in political science in 1950. From a young age, Ken said his father often voiced his concern about the lack of youth involvement in the democratic process. According to Denise Konan, dean of UH-Mänoa’s College of Social Sciences, the Inouye Center will serve as a gathering place for youth and will help to fulfill Sen. Inouye’s interest in engaging students in politics. It will help to advance public understanding of Hawai‘i and U.S. political history, democracy and government, public service leadership, democratic ideals and global awareness through a variety of civic engagement efforts. The center will be built around three “pillars”: academic programs, community engagement and historical preservation, serving as an archive for all of the senator’s writings, presentations and other documents. 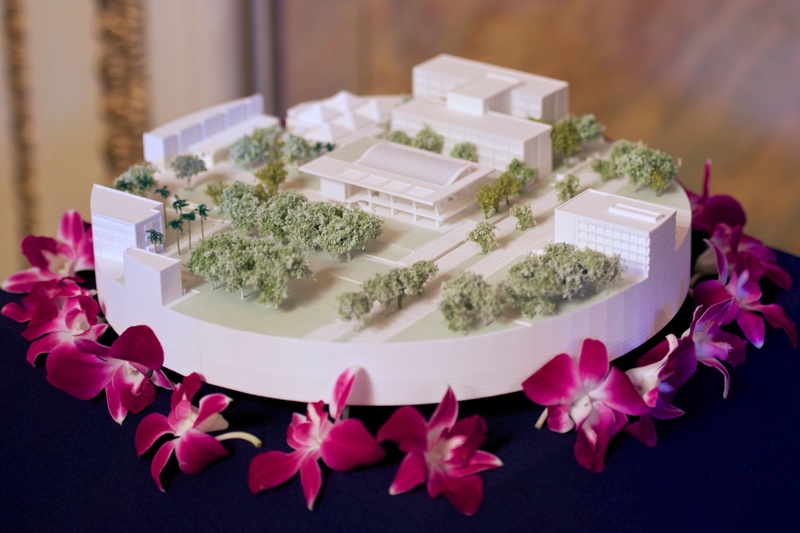 The Daniel K. Inouye Center will be built on the site of the current Henke Hall along East West Center Road, just mauka (mountainside) of Kennedy Theatre. A timetable for construction has yet to be established. “I think that once it comes to fruition and once all the pieces come together and people see it in action, it will be something that for many generations to come will be able to have a positive effect on the university, its students and the surrounding community,” said Ken Inouye. Ken’s love for his father and his memories of their life together are still a large part of his life. This Dec. 17 will mark two years since his father’s passing. But memories of the time father and son shared live on in Ken Inouye. He said he still feels the spirit of the ever-present father he loved. Ken’s mother, Margaret “Maggie” (Awamura) Inouye died in 2006. A few years later, Sen. Inouye married former Japanese American National Museum president Irene Hirano, who now heads the U.S.-Japan Council, headquartered in Washington, D.C. Ken Inouye and Irene Hirano Inouye, along with Sen. Inouye’s longtime chief of staff, Jennifer Sabas, have taken the lead in working with institutions and organizations seeking to perpetuate Sen. Inouye’s legacy. For more information on the Daniel K. Inouye Center for Democratic Leadership, visit http://www.socialsciences.hawaii.edu/about/daniel-k-inouye-center.html. Averie’ Soto received her bachelor’s degree in journalism from the University of Hawai‘i at Mänoa this past May. She resides on Kaua‘i, where she is a freelance writer.